John Wells joined Interface in 1994 just months before Ray Anderson had his now-famous “epiphany.” With a bachelor’s degree in Industrial Management from Georgia Tech, John shared with Ray a love of all things Georgia Tech. Joining wholeheartedly in Ray’s journey toward sustainability, John’s enthusiasm and focus underscored his leadership within Interface, leading to increased responsibilities and his final role as President and Chief Executive Officer of Interface Americas before retiring in 2016. Under Wells’s leadership, the Interface Americas business expanded into an industry leader. Through the years, John was a champion in developing and articulating Interface’s Mission Zero brand promise both internally and to the world – a promise to eliminate any negative impact the company has on the environment by 2020. Since retiring from Interface, John has been advising companies engaged in sustainable energy and advanced materials. John has served on the Board of Directors for the Carpet and Rug Institute (CRI) since 2005 and he was elected CRI Board Chair in 2012. He serves on the Board of Directors for the WC Bradley Company and the Lovett School. 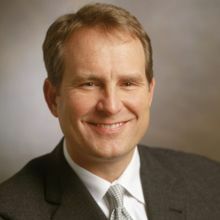 John also serves on the Georgia Tech Foundation’s Board of Trustees, and he serves on the Advisory Board for the Ray C. Anderson Center for Sustainable Business at Georgia Tech's Scheller College of Business.